Given a graph consisting N nodes (labelled 1 to N) where a specific given node S represents the starting position S and an edge between two nodes is of a given length, which may or may not be equal to other lengths in the graph. It is required to calculate the shortest distance from the start position (Node S) to all of the other nodes in the graph. Note: If a node is unreachable , the distance is assumed as -1. The next M lines each consist of three space-separated integers x y r, where x and y denote the two nodes between which the undirected edge exists, r denotes the length of edge between these corresponding nodes. The last line has an integer S, denoting the starting position. For each of the T test cases, print a single line consisting N - 1 space separated integers denoting the shortest distance of N - 1 nodes other than S from starting position S in increasing order of their labels. The straight line is a weighted edge, denoting length of edge between the corresponding nodes. 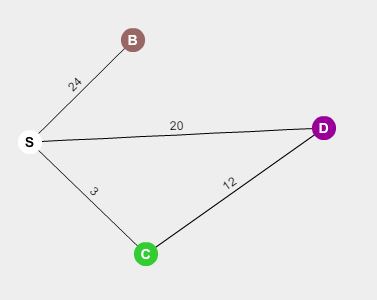 The nodes S,B,C and D denote the obvious node 1,2,3 and 4 in the test case. * Represents Node of the graph and contains node id along with the nodes and distance that are attached to it. We also have added hashCode, equals and compareTo method as we will be using PriorityQueue to keep distance for each node. In order to do this, we define equality based on id so that we don't add two records with same id. However, we want to sort the Nodes on the basis of their distances so we use distance field in compareTo method. * Updates distances of nodes in input array with the distance from input source node. // as initially distance of all nodes are set to max integer value. // Since Java implementation of priority queue doesn't allow mechanism to update the priority once it is added. // Moreover it becomes unstable if attributes used in compareTo are changed after addition. // In order to work this, we remove sourceNode, update distance and then re-insert it. // linked node's priority so we do same ritual of removing, updating and re-inserting!